Martin Hopkinson put forward that John Munday, curator at the National Maritime Museum for many years, painted the portrait of Commodore Sydney Stewart Hall. The artist John Munday died in 2012. 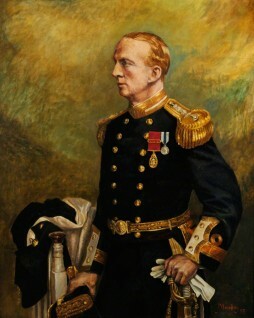 Roderick Macleod dated the commodore’s sleeve to between 1915 and 1919, before Munday was born: the painting was created retrospectively. Geraint Richard Hall provided a brief biography of Hall: he was born 16 June 1872 and died 10 January 1955, after an illustrious career in the Royal Navy. Pieter van der Merwe mentioned a black and white photo of the painting he had seen previously. More significantly, the NMM catalogue entry of his 1950 painting of HMS ‘Calliope’ in the Tyne (BHC4246), states that John Munday (1924–2012), left the Northern Grammar School, Portsmouth at 16, and worked in the City Library until joining the Navy in 1942. He was demobilized at sub-lieutenant in 1946, and studied fine art at King’s College, Newcastle, under the tuition of (Sir) Roger de Grey, later President of the RA. He joined the Museum in 1951, as Librarian, and retired as Department Head of Weapons and Antiquities, 1984, becoming an authority on E. W. Cooke, Victorian marine painter. He drew and painted for pleasure all his life, including as a copyist of historical works. Pieter van der Merwe passed on a message from Brenda Munday, the artist’s widow, who confirms the painting is by John: she could not recall exactly who commissioned it (as a posthumous portrait) but it seems to have been for the National Museum of the Royal Navy collections. The sitter's family were there when it was unveiled and the Hall family were very pleased with the result. Did National Maritime Museum curator John Munday paint this portrait of Commodore S. S. Hall?